Jure Cerkovnik (Slovenia, 1990) is a young Slovenian classical guitarist. 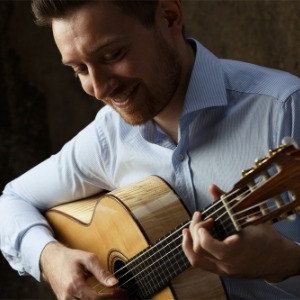 He graduated in 2013 from Universität für Musik und darstellende Kunst in Vienna (Austria), where he studied in class of distinguished guitarist and pedagogue Alvaro Pierri. In 2015 he finished his master studies in the same class. His second master degree Jure completed on Hochschule der Künste in Zürich in class of professor Anders Miolin in June 2017. Since 2016 he has worked as an assistant at the same academy. Jure participated on many national and international music competitions and won 17 first, second and special prizes. He performed throughout Europe in Italy, France, Switzerland, Germany, Austria, Belgium, Czech Republic, Serbia, Croatia, Montenegro, Bosnia and Herzegovina and Slovenia. He participated on various festivals such as Forum Wien, Vienna Guitar Festival, Postojna Guitar Week, Sarajevo International Guitar Festival, Acerra Guitar Meeting, where he regularly teaches on guitar masterclasses. In February 2017 he had his solo debut in renowned Konzerthaus in Vienna. Jure has also performed as a soloist with several orchestras, Symphonic orchestra Simfonika from Vrhnika (Slovenia), and Sarajevo philharmonic orchestra under the baton of Austrian conductor Ralph Kircher. He has made many recordings for archive of RTV Slovenia. His repertoire consists of numerous pieces of different epochs, from Renaissance and Baroque, to contemporary guitar works of 20 th and 21 st century. His first CD Palettes was released in December 2017 under the Baros Records label featuring works of Ponce, Ourkouzounov, Rebay and Bogdanović.